Access thousands of local, national and international newspapers and magazines with full online content. 2. Create a Pressreader user account by clicking on Sign in. 3. Download the application Pressreader on your tablet, smartphone or e-readers running iOS, Android, Android for Amazon, Windows and Blackberry. 4. 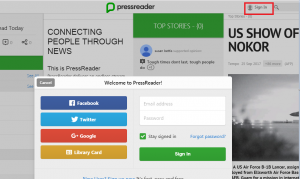 Launch the application and log in with your Pressreader user account (not your Library card). Now your app will work for 7 days. After 7 days you need to go to a-z.lu, log in with your Library card, search for Pressreader, go to Pressreader and log in with your Pressreader user account. The app will automatically renew your access for another 7 days. Please note that the Pressreader site which you access through a-z.lu is continuously available and does not require a Pressreader user account.